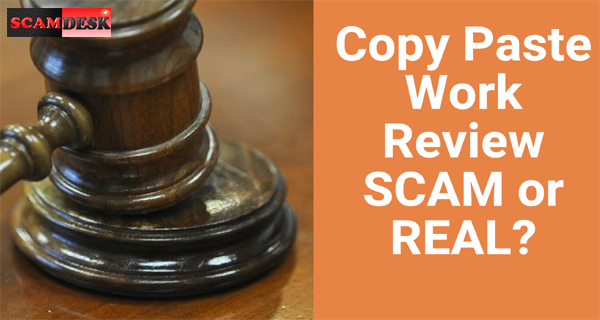 This why Online Copy Paste Jobs Is A SACM in INDIA! You are here: Home / Online Jobs / This why Online Copy Paste Jobs Is A Scam in INDIA! After reviewing top 25 online copy paste jobs website we realized all of them are scam or somehow trick you so that you can’t earn money from them. Here I review the top 7 copy paste jobs and my point that easily proved that all of them are scam. Some of copy paste work website show us demo for copy data from excel to work or sometime work to excel. Do you know how they create such scam project? Actually they are copy data from internet and save it to either word or excel file. When every people join into those website you have to work like a stupid because no one going to pay you if copy internet coped data from excel to word. So always avoid this of job. This is another way that used to scam the chip people. I am surprised people still find a jobs on internet that can way easy and dream about earn money like a king. So here is another trap , you have to copy 10-15 data into a contact form and they assure you that you can earn money by doing contact form submission copy paste work. Actually it’s a big scam. The use of contact form is for getting customer inquiry , not to be for earning purpose. So please avoid this type of job. Most of the Online Copy paste jobs provider forces their member to work in ad posting jobs in order to get paid. But you know ad posting jobs and online copy paste jobs has way deference. You can actually work and earn here but I called it’s a scam, because why should you accept to get paid only Rs-1-2 by doing copy paste ad posting jobs! If you search for ad posting jobs usually you will be paid minimum of Rs-5 to maximum of RS-15.00. So if any company provide you ad posting jobs instead of copy paste jobs either tell them to refund (How to refund your money once you’re lost it in a scam online job? )Your money or paid more. They are sending you CD Disk and you have to cut, copy and paste form Data disk to work or in a specific software. Unlike others online copy paste jobs it’s another scam. The trick they are using is – They will give you a work target that is very hard to achieve within the given date! If you are expert monkey and manage to complete the goal of copy paste, finally they will reject your work form some type of other reason. So watch it and avoid it. They give you any type of data (Most probably they are copied it from Internet) in notepad file, and guess what you have to copy those data into word document. How simple is not it? But unfortunately if you join on such work the only one benefits will be lost of your registration fees. Better to avoid it. Everyone knows there is ton of free eBooks are now easily downloadable from internet. Scammer use to download such PDF and give those files as online copy paste jobs. You can work just copy each page from PDF to work and submit your report. The trick is some of PDF files may be locked from copied , there for you can’t complete entire project and caused you lost of registration fees. It’s another offline copy paste jobs where you will be mailed a Database CD Disk into your home. Now you have to open the disk using your computer and search on Query box. There will be some keyword to search, whenever you will search a new keyword you will get a result of 10-15 lines. Now copy the result and paste it into doc files like MS-word. That’s it, but unlike other offline data entry jobs it’s another scam. Conclusion: Hope this all the scam trick will open your eyes and help you to detect scam. Dear friends instead of this mention 7 online copy paste jobs scam, there is still new type of scam are growing up on internet! May be you are the one of the victim of it. Let take a time and comment here about new type of scam. Its help out new blog reader to avoid them. i find this site in google http://www.rbcinfotech.com. it says a free plan(no registration fees) but it want my all document copes .